Welcome back everyone! 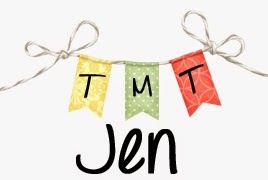 I hope you enjoyed week three of Teachers Write! I love seeing people blogging, tweeting and sharing on Facebook. Gae shook her pom poms over on Facebook earlier this week. We're halfway through Teachers Write but there is still lots of time to write and reflect on writing habits and how living the life of a writer might help you work with student writers. I don't have any pom poms with me today...but I do have a big ol' thumbs for all of you! 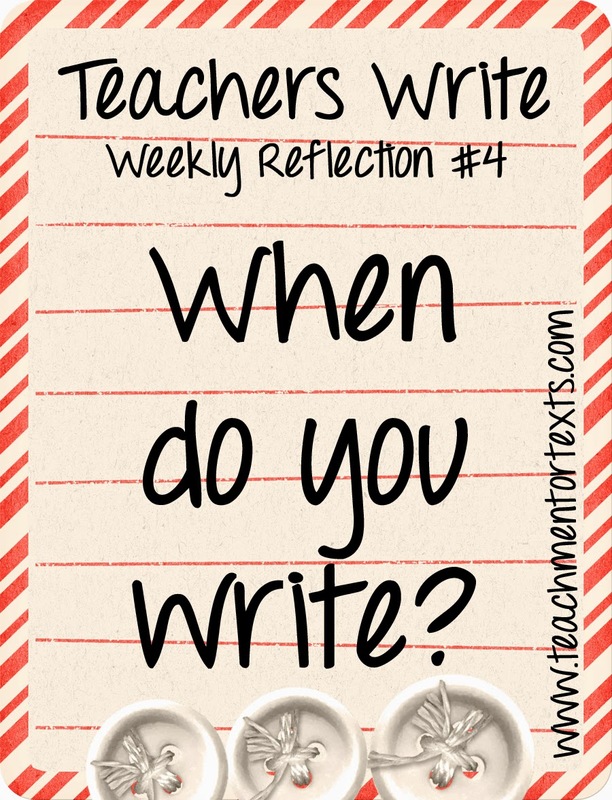 Today, I'm continuing with my weekly reflection questions and this time I want to know WHEN you write. Some of us talked about this last week when we shared where we write but I still think it's important to think about when we write. Last week, I shared how I squish my writing time into my life where I can and that applies also to when I'm writing during the day. It might be the morning, the middle of the day, or ten or eleven at night. Can you guess when I do my best? I bet you might BUT I'll let you look at the evidence and then see what you think. Here are some daily notes from the last two weeks that relate to when I write. TUESDAY: I woke up early, took a shower and snuck into my kids' room to write before they woke up (they are sleeping downstairs on the couches...because it's summer? idk.). I hear them talking to each other now but I probably wrote for an hour-ish and I got in 1,500 words. I really just let myself write something and not worry about it being great. It felt awesome! WEDNESDAY: Midday writing today. 1,000 words, took about an hour but it's getting easier, words are flowing more now. Hooray! THURSDAY: I left the house before the kids were up to write at Starbucks. I was there about two hours and got in 1,000 words. Cruising along! FRIDAY: It doesn't feel like a yes because it's late and I'm tired and starting to see blurry BUT I did get in an hour of writing and 500 words so it's a yes. I meant to get up early and write but it didn't work out this morning and I'm definitely tired now. SUNDAY: I got home super late and had to get my IMWAYR post up and then spent a crappy 25 minutes staring at a free write I did and reworking it for where I am in my MS. It wasn't pretty but it happened. WEDNESDAY: Ugh...okay, I added 100 words but I'm so exhausted. I was back at work today from 6:00-4:00 for summer hours and I'm wiped. I tried...maybe I'll dream about my characters and then it'll just flow tomorrow night! THURSDAY: My 4yo is still up and he's snuggling with me because my husband isn't home yet. I have my computer open but I'm so tired and have decided it's just not going to happen. What do you think? It's pretty clear - just from the lack of exclamation points - that writing at night is a struggle for me. I do best when I write first thing in the morning when my brain is fresh. I am still able to get something done most nights and that counts, but I feel way better about my writing in the morning. Having daily notes to help me reflect is useful and I believe asking student writers to reflect upon their writing and reading lives is important, too. It's easy to forget how much we struggled one day or how great we felt the next but by keeping notes when conferring with students or asking students to write a quick note of what they worked on and how it felt, we have evidence to return to and use for reflection. I'm such a fan of using evidence to guide a conversation because it's hard to argue with evidence. It gives a student the opportunity to look at information and come to his or her own conclusions about what's working and what might need to change. Obviously, during a school day, students might not have flexibility in when they get to write but they might think about when ideas come to them or reflect on other aspects of their writing lives. This is getting long...but at ISTE, I had the pleasure of hearing Jaime Casap speak. He works for Google and explained, "'Failure' is an old word. We live in a world of iteration. We are constantly betting better." By reflecting, we are able to see what we might change for the next iteration. Every time we sit down to write, we can learn how to be more effective as a writer. My goal was still to write for 25 minutes every day. Last week my word count was at 7,759 and I hoped to get to 13,000. I only made it to 10,192, mostly because I wasn't able to get writing time in until late at night when it just didn't work. Boo! BUT I can totally see what I need to adjust. I did work on my query letter and I think I have a pretty strong pitch. I also reread the current draft of the novel I have been revising. I made notes throughout for changes I need to make now and also looked for places where I can split the story into chapters. As I found chapter breaks, i wrote out a summary of what happens in each chapter so once I type that, I should have a nice start on a synopsis. Honestly, I think I need to take a break from drafting. My goal for this week is to focus in on and finish another round of revisions so I can get it off to one more beta reader before one last round of revision and I get super serious about querying. Thanks for hanging in this long, for checking in, and for keeping up the great work!!! Go you! How does reflecting help you assess what's working and what to adjust?